I do not expect many readers to absorb all the detail of this improvised operation. I spell it out in detail to make clear just what a big wrench in the works it is. The Japanese are sure to lose the entire substantial force which garrisoned Tanega-shima. All their effort digging caves and camouflaging guns there will be overcome and eventually lost to time. But that price has bought them a large impediment to the complicated plan of their enemy, of an inestimable value. Yet much of that plan still unfolds, on schedule. Yesterday afternoon saw the two lead divisions at each of the three main beach heads land two combat regiments. That much was according to plan. The plan of course assumes some resistance from the enemy, but that has been consistently inconsistent. Our landed soldiers and Marines got through the first mile and more inland finding only disorganized resistance. The worst were pairs of light machine guns hastily set up in the rubble and craters made by our pre-invasion bombardment. They are also being harassed by long range fire from inland mountains and high points to the sides of each landing beach. There is nothing to do about it but to push into those heights. Forces are moving and timetables are being adjusted. This morning the weather brought low clouds with a chance of rain and heavy kamikaze showers. Before that a wave of suicide boats made out from the many nooks on Koshiki-retto, through a dim pre-dawn haze. The 160th Regiment of the 40th Infantry Division has been working to clear any threats from that island since X-4, together with Navy ships circling the jagged shore. Much ordnance has been expended against the rocks there, blasting any suspicious looking crevice which might hide a small ship. But there are a great many crevices and clearly some of the deadly boats survived. Kamikaze planes were expected at the first bit of bad weather, but the risk from attack boats was supposed to be eliminated. Destroyer picket screens against incoming aircraft are well beyond Koshiki-retto from this invasion fleet. Just one destroyer and a few patrol boats were patrolling between our big ships and the island. 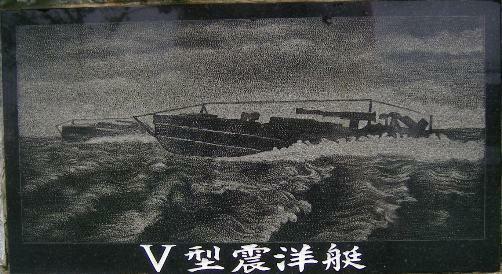 The USS Charette claims five shinyo sunk, with another probable. That may have been most of them, but we know at least three more got through, because they found the cruiser USS Little Rock and my recent acquaintance the USS Red Oak Victory. The Red Oak was back to her old job of at-sea re-supply of ordnance to Navy ships. The Little Rock had done her share of pre-invasion shore bombardment, and was to continue the job of delivering fire support after taking on more deadly packages. The Red Oak Victory was parallel to the shore, less than two miles off, tethered to the Little Rock. Gunners on the Red Oak may have hit some of the attacking boats, but the Little Rock reports that two of them got close enough to blow big holes in the cargo ship’s hull, possibly starting off secondary explosions in the holds, and put her under in a blink. It was all the cruiser could do to cut the transfer lines and get clear of the sinking ship so they wouldn’t smash any swimming survivors. The Little Rock’s gunners barely caught a glimpse of a final suicide motorboat gunning past the rolling wreck. The boat closed the last few dozen yards to the Little Rock and its multi-hundred-pound bow charge ripped through the light cruiser’s armor. I have no word on fatalities from below, but one machine gun crew on deck reported injuries from wood splinters and impact from one severed human hand.